(June 13th, 2016) Tensions between NATO and Russia, already high, have gone a bit higher with the vaguely threatening remarks by the Russian Foreign Ministry that Russian leader Vladimir Putin would respond to a U.S. Navy destroyer’s entry into the Black Sea with unspecified measures, Reuters and other news media report. Turkey, Romania and Bulgaria, all of which border on the Black Sea, are members of NATO. 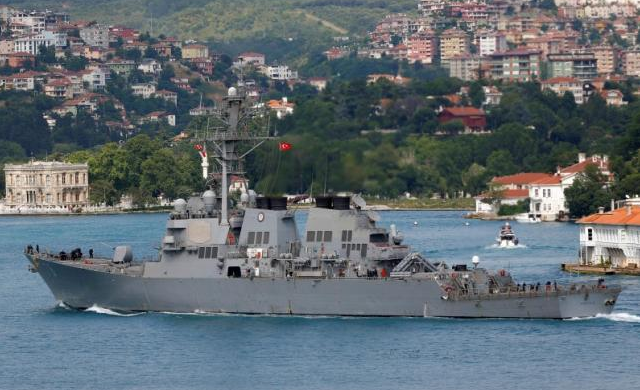 Russian state media reported that the USS Porter, a U.S. naval destroyer, entered the Black Sea a few days ago, a move that state media said angered Moscow because the warship was recently fitted with a new missile system. U.S. Navy officials told reporters on June 8 that the U.S. would also have two aircraft carriers in the Mediterranean this month ahead of a July NATO summit in Warsaw as Washington continues to seek to address Russia’s intensifying military activities in eastern Europe and Syria.